After a long Christmas break, some of you may be excited to return to College life, while others are dreading the return to essay deadlines and exams. We’ve put together our top picks for the week that will be sure to make the transition from home to college a little easier. This Monday the University Philosophical Society (the Phil) is presenting the Gold Medal of Honorary Patronage to Sebastian Barry. 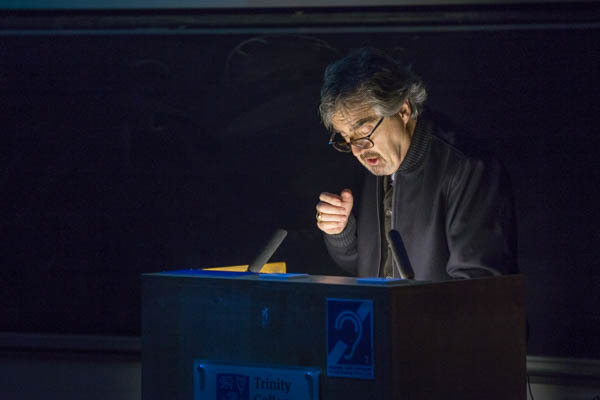 Sebastian Barry is an Irish playwright, novelist and poet, who is world renowned for plays such as Boss Grady’s Boys, The Steward of Christendom and most recently Andersen’s English, which toured in the UK. Many of Barry’s books such as A Long Long Way have been shortlisted for awards like the Man Booker Prize while The Secret Scripture and Days Without End have both been individually awarded the Costa Book of the Year. Days Without End also won the James Tait Black Memorial Prize for fiction, the oldest literary award in the UK. This is sure to be a fascinating event which will intrigue both fans and aspiring authors alike. The event is taking place in the Graduates Memorial Building (GMB) at 1pm and is open to members only. On Tuesday, Trinity St Vincent de Paul (VDP) is proving it’s not too late to get help out with the incredible work of the society with its Re-Intro Night in the Phil Conversation Room at 7pm. Attendees will be treated to refreshments and learn of all the ways to get involved with the group this term. VDP is renowned for its trips away and its annual Vincent de Ball and also provides plenty of non-vetted activities where you can really give back to society. DU History is back with their inaugural Pub Quiz. Don’t miss this opportunity to witness the famously competitive spirit of a DU History Pub Quiz. The event is open to members and non-members alike. Entry fee is just €1 and each team will need four members. The event will be held in the basement of Doyles at 7pm. Let’s hope the hours you spent watching The Chase over Christmas pay off. DU Players Theatre will be play host to Improv, She Wrote once again this Thursday for a Trinity Fringe special. Improv, She Wrote is Trinity’s only improv comedy group and is now in its second decade of performing at the Players Theatre. Improv, She Wrote will be performing both short-form and long-form improvisation, based entirely on the audiences suggestions. If previous performance are anything to go by, the night will be an hilarious and interactive experience to remember. The event will be held at 8.30pm in the Players Theatre. Head over to Wynn’s Hotel on Abbey St this Friday and enjoy DU Film Society’s annual Film Network event. This event brings together a plethora of speakers from all corners of the film industry. From writers, to actors, to directors, the society have covered all the bases and has organised an event that is sure to appeal to anyone interested in the world of film. Fair City TV writer and Trinity graduate Nick Wilkinson will be speaking on Friday, as well as filmmaker Gerard Walsh and actor Dave Kelly. This is a ticketed event so be sure to secure one through the event’s Facebook page.